This was originally just a test to see if the new atmospheric code handles objects in various situations, but I figured it may interest others as well. With new atmosphere in place we went to test how an object at orbit would look like from the ground. We made a 5km long white cylinder with approximate diameter of 1.5km and put it into orbit at 400km. What does make these visible gradient stripes in the atmosphere? I don't know why I haven't thought of suggesting something like this before! Do you think you could make a video of you flying from the ground up to the cylinder and back? Be really interesting to watch that white line slowly become a huge cylinder. BTW, would the cylinder actually have an orbit or is it just frozen in place up there? 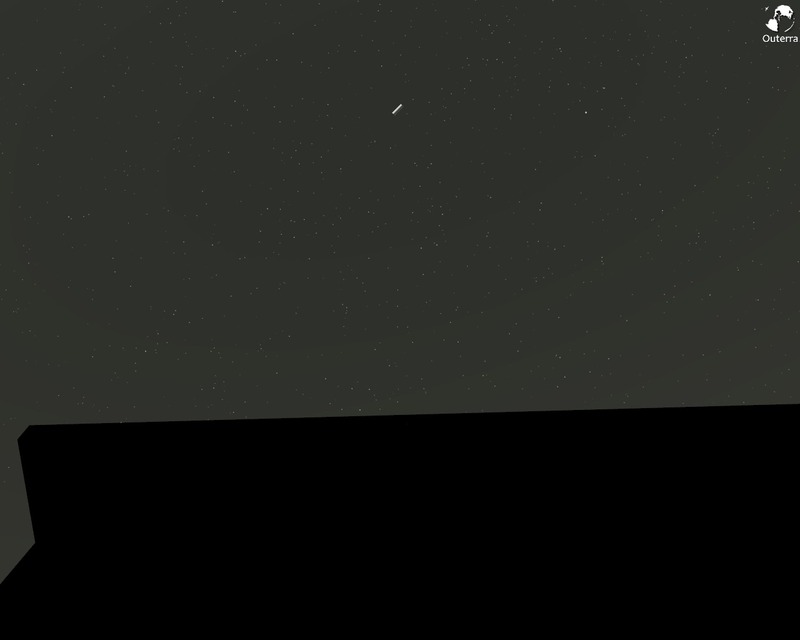 Also very cool that you are able to simulate an eclipse already! Awesome! 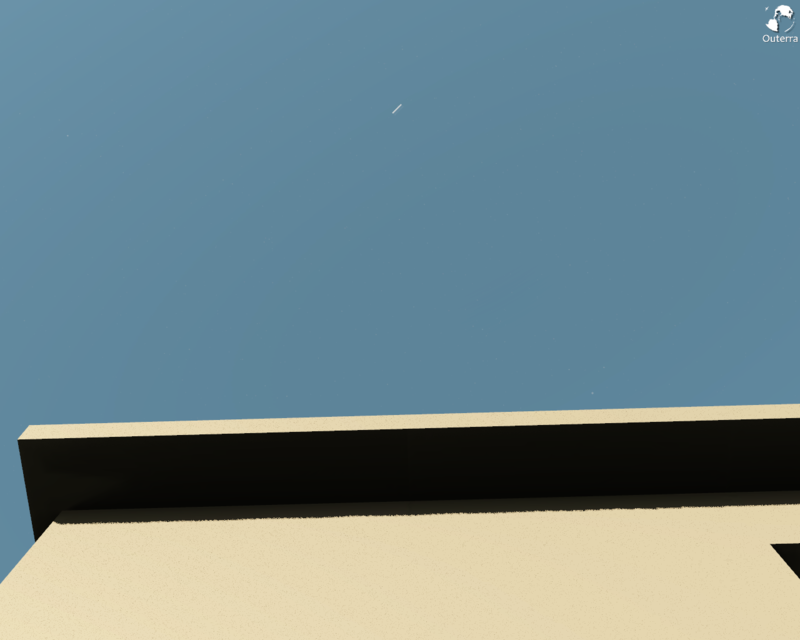 It will definitely make the sky much more interesting if we can see orbital vehicles from the ground. Sorry, that's an artifact of jpeg image compression. I've swapped these for PNG versions, the jpeg versions are here for comparison: morning, before dawn. Mind you, some stripes are almost always visible on such slowly changing color gradients because of the limited resolution of color channels (and monitors), you can see them where the colors components in PNG images change by 1 (in 0..255 range). This can be helped by dithering. Right now the cylinder is basically in a fixed position, attached to a specific terrain tile LOD level so that it gets rendered only while the tile itself is rendered. Unfortunately, flying up to the space kicks it away. We'll be handling it in a different way, for now we could stick the object there for permanent rendering. Nevertheless, the featureless cylinder doesn't feel as a huge object in itself, when there are no features to compare its size with. But we'll put a space station or something there, that will be better. But we'll put a space station or something there, that will be better. The International Space Station, or a giant futuristic one? I love the morning screenshot. If you zoom in through a graphics program, you can really see its shape and the reflected light on the "dark" side of the cylinder. Can't imagine what this would be like in real life. Look up in the sky one day, marvel at the sun and crescent moon, and then suddenly ... "Look, Ma! It's RAMA!!!" I think it can be more interesting & realistic to see how we can see a whole planet from the surface. Can you try that ? Like this screenshot for exemple : http://www.infinity-universe.com/Infinity/images/zoom/Archives/viewsize/planet_tex_new_100.jpg ? The ISS is rather small (109m long), so it will be hardly visible, but being able to fly up there might be an interesting demonstration nonetheless. But I'm also interested in something bigger that can be visible from the ground like the cylinder here (which is almost 50 times as big as ISS), but with a more interesting shape. Rendering planets or moons is no different from this, so if we had a proper model/textures for it, it could be done. In fact we could try it with the moon, could be even placed on the correct position. I'll have to dig up some equations for that. What about aircraft contrails? Jet-liners at altitude can generate contrails that are 50nm long if conditions are right, maybe longer. Would be nice if Outerra could support these types of atmospheric effects. Hmm, contrails should be easy, except for the closeups when it should transition into a cloudy thing. Anyone's got a picture how it looks from a short distance?